In 1997, Pope Saint John Paul II instituted a day of prayer for women and men in religious life. This celebration is attached to the Feast of the Presentation of the Lord on February 2nd. The celebration of World Day for Consecrated Life is set aside to highlight the gift of consecrated persons for the whole Church. 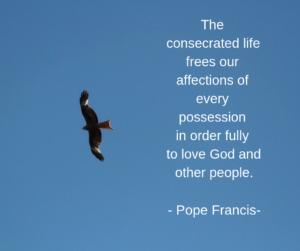 On this day people are invited to pray for all those who have made commitments in the consecrated life. May they continue to be inspired by Jesus Christ and respond generously to God’s gift of their vocation. We give thanks for all who spend their lives in loving service – in families, in workplaces, in governments, schools and universities. We also give thanks for the multiple gifts of Earth – knowing that all life is sacred and all beings reveal to us something of the work of a loving Creator. as well as members of Secular Institutes. and courageously to your will. Bless anew all who spend their life energies in loving service of others and in working for justice. Renew our sense of deep gratitude for all your gifts of life and deepen our awareness of the sacredness of all life.